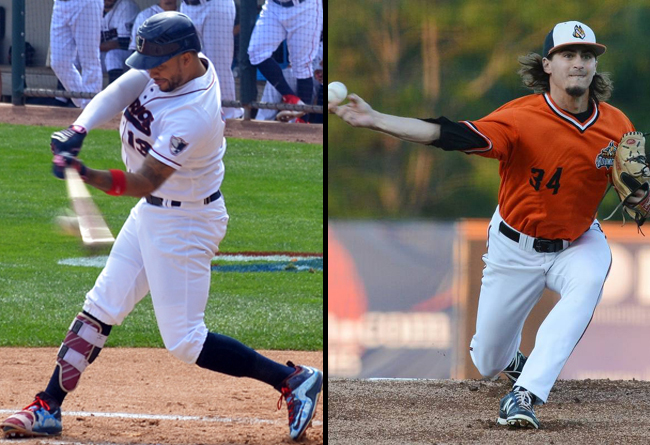 (Bridgewater, N.J., Jan. 23, 2017) - The Somerset Patriots have announced the re-signing of outfielder Carlos Guzman and the signing of right-handed pitcher Seth Webster for the 2017 season. Guzman enters his second season with the Somerset Patriots and fourth in the Atlantic League. Guzman hit .264 with the Patriots last year, and finished second on the team in doubles (21) and home runs (12). Additionally, he ranked fourth on the team in RBI (58), hits (108), at-bats (409) and games played (111) along with fifth in stolen bases (11). He previously played briefly for the York Revolution and the Road Warriors in 2011 before spending all of 2015 with the Camden Riversharks. The Brooklyn, New York native played in 135 games with the Riversharks in 2015 (second-most in the league). He ranked third in the league in RBI (76), seventh in stolen bases (23), eighth in hits (140) and ninth in batting average (.276). He also tallied 10 home runs, 27 doubles and led the league among right fielders in outfield assists (10). Guzman spent the first five years of his professional career in the New York Mets organization, reaching as high as Double-A Binghamton from 2009-2011. He spent the next three seasons in the Can-Am league, including a year with the New Jersey Jackals (2012) and a year with the Newark Bears (2013). The switch-hitter owns a .268 batting average with 74 home runs, 440 RBI, 153 doubles, and 75 stolen bases over his 10-year career. Webster enters his first season with the Somerset Patriots and first in the Atlantic League. The 6’5” righty spent parts of his first four professional seasons with the Schaumburg Boomers (Frontier League). Over his four seasons there, Webster went 22-15 in 51 starts with a combined 3.28 ERA. In 2015, Webster made one start for the Boomers before the Atlanta Braves purchased his contract. The Alexandria, Louisiana native went on to go 8-7 with a 2.82 ERA with High-A Carolina that season. Additionally, Webster yielded just eight total walks in 130.2 innings of work that season and was later named a 2015 Atlanta Braves organizational all-star. Webster’s calling card over his career has been his low walk ratios. The side-armer has never walked more than 24 batters in a full season, and owns a career 1.3 BB/9 (walk-per-nine innings) ratio. Last year in Schaumburg, Webster walked just 20 batters and finished third in the league in strikeouts (108) and innings pitched (126.2). The Nicholls State University alumnus owns a career 30-23 record with a 3.23 ERA, 356 strikeouts and just 68 walks over 462.1 innings pitched. Webster’s rights were acquired by the Somerset Patriots in a trade with the Boomers earlier in the off-season for future considerations.